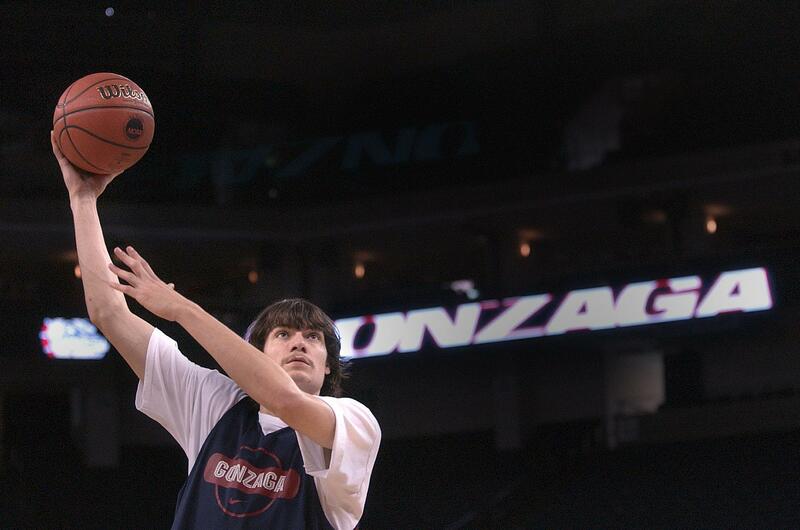 UPDATED: Thu., Feb. 7, 2019, 5:40 p.m.
Gonzaga great Adam Morrison got the Hall call from the West Coast Conference. Morrison, the 2006 co-national player of the year, will be inducted into the WCC’s Hall of Honor on March 9. Ceremonies for the 10 inductees, one representative from each member school, will be held at the Orleans Hotel in Las Vegas, site of the WCC men’s and women’s tournaments from March 7-12. Morrison led the nation with a 28.1-point scoring average as a junior, helping the Zags to a 29-4 record and a No. 5 ranking in the final AP poll. He made 49.6 percent from the field, including 42.8 percent on 3-pointers, and 77.2 percent at the free-throw line. The Zags went 14-0 in the WCC and won the conference tournament, earning a third seed in the 2006 NCAA Tournament. They lost in heartbreaking fashion to UCLA in the Sweet 16. Morrison, a Mead High product, earned consensus AP All-America first-team honors and shared player of the year honors with Duke’s JJ Redick. He was the third overall pick in the 2006 NBA draft, the highest by a Zag. Morrison was named the conference player of the year in 2006. He was a two-time All-WCC first-team selection and two-time WCC Tournament Most Valuable Player. Despite playing just three seasons, Morrison ranks No. 3 on Gonzaga’s all-time scoring list with 1,867 points. He posted five 40-point games. His 28.1 scoring average is third behind all-time GU leading scorer Frank Burgess, who averaged 32.4 points in 1961 and 28.9 in 1960. Morrison is second in school history with a 21.3 scoring average in NCAA Tournament games, behind Dan Dickau’s 23.5. BYU’s Tiffany Lott-Hogan (track), Loyola Marymount’s Tara (Erdmann) Welling (cross country/track), Pacific’s Jayne McHugh (volleyball), Pepperdine’s Gualberto Escudero (tennis), Portland’s Stephanie Lopez Cox (soccer), Trevor Newquist of Saint Mary’s (soccer), San Diego’s Ali Cox (rowing), San Francisco’s Orlando Smart (basketball) and Santa Clara’s Caren Horstmeyer (basketball) comprise the rest of the Hall of Honor 2019 class. Tickets to the WCC Hall of Honor Brunch & Induction Ceremony cost $40 and may be purchased by contacting Lindsey Jones via email (Ljones@westcoast.org.). They must be purchased by Feb. 25. Published: Feb. 7, 2019, 11:20 a.m. Updated: Feb. 7, 2019, 5:40 p.m.